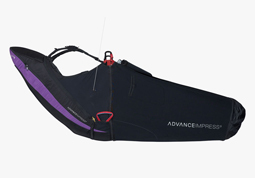 The IMPRESS 3 introduces a new generation of harnesses to the thermal, cross country and competition pilot. 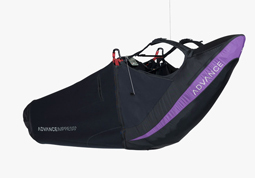 This logical continuation of the unique seatboardless LIGHTNESS concept provides the highest degree of comfort, and is aerodynamically as good as you can get. With an LTF certified back protector the IMPRESS 3 weighs only 4.7 kg – extremely light – and compact. 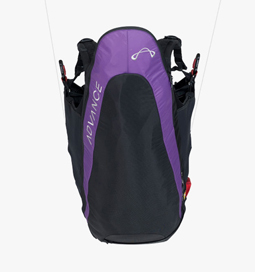 The IMPRESS 3 weighs only 4.7 kg – quite revolutionary for a harness with speedbag and approved protector. This weight reduction results from the sum total of numerous design and material details; lighter materials and innovative design also considerably reduce the packed volume. The results of a lot of wind tunnel measurements were considered in the development of the IMPRESS 3. We specifically directed our focus on the aerodynamics, namely the airflow over the chest and leg areas. A low drag and geometrically optimised harness with a novel cockpit-spoiler concept is the result.